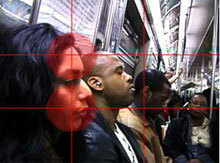 For the rule of thirds, imaginary lines are drawn dividing the image into thirds. 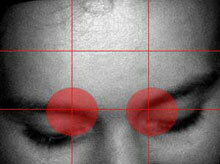 The most important elements are placed where these lines intersect (see diagram a.) In addition to using the intersections, it also helps to use a 2 to 1 ratio (thus dividing the image both horizontally and vertically into thirds) so that nothing is dead center, which makes for a static image. 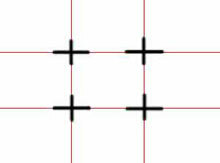 Instead, when placing the horizon line of a landscape, or the eye line of a person, use the lower or upper third as an approximate guide. In the subway shot, the most important person is the woman in the third on the left of the image. She could be the main character of a video, or she could be about to do something important that will influence the story. The image on the right is an extreme close-up of the eyes of a girl. They are placed on the line along the lower third of the image. This image draws us in, we share the introspective moment that this girl has. In a video there could be a voiceover narration telling us her thoughts, for example.